It is autumn and as much as I hate to admit it the sun is quickly disappearing. Not only is it disappearing but it is getting colder and the children have all headed back to school. That combination will usually lead to one outcome.. bugs and sickness. If your child has just started for the first time like D has it's likely to be a long autumn and winter. As part of Us Two Plus You celebrating our Blogiversary we have teamed up with Higher Nature to giveaway some of their Kids range of vitamins. As we all know vitamins are important, more so over the autumn and winter months when our immune systems are really put to the test during daily life. It is even more important for our children who will be in contact with other children and adults a fair bit of their day. Higher Nature was founded by Brian and Celia Wright with the intention to make a significant difference to their customers health. They do this through the use of active ingredients with the levels being set my scientific evidence about their effectiveness and safety. Their vision is to provide ethical, high quality and well researched nutritional products. They wouldn't try to market a product if they didn't think it would have health benefits and was ethical, even if it was a best seller! 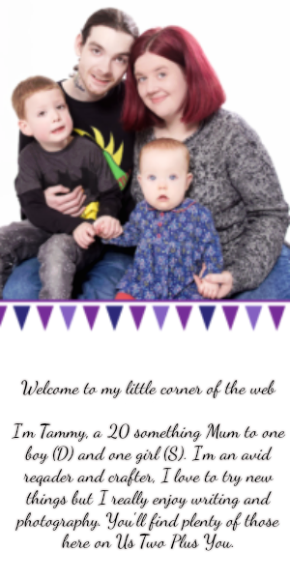 We have two of their products from the kids range to giveaway to one of our readers! 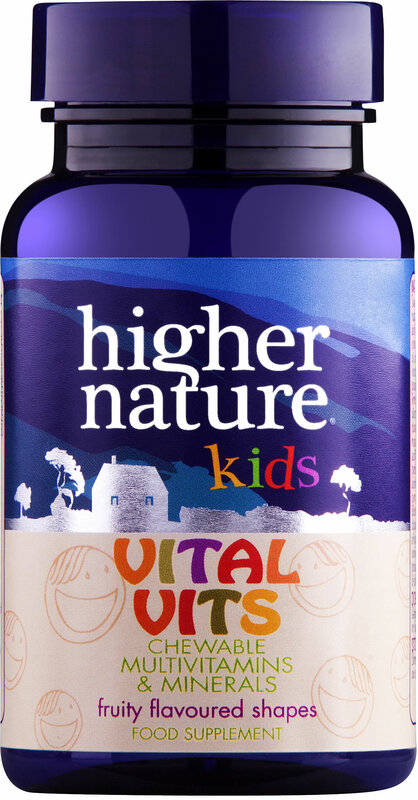 The higher Nature Kids Vital Vits are a chewable multi vitamin designed with kids in mind. They contain 19 essential vitamins and minerals at levels suitable for children aged 3 and over. With each chewable being a one day dose it is easy to take and you won't need to remember different timings! Higher Nature Kids Vital Vits also come with 3 different flavours each has it's own fun shape to please even the fussy eaters. There are mango robots, lime aliens and raspberry teddies. You don't have to worry about added nasties as they are free from artificial sweeteners and preservatives! The vitamins and the levels of each found inside each chew-able multi vitamin are; 400µg Vitamin A, 5µg Vitamin D2, 6mg Vitamin E, 80mg Vitamin C, 1.1mg Vitamin B1, 1.4mg Vitamin B2, 8mg Vitamin B3, 6mg Vitamin B5, 1.4mg Vitamin B6, 200µg Folic Acid, 2.5µg Vitamin B12, 50µg Biotin, 56mg Magnesium, 7mg Iron, 10mg Zinc, 0.5mg Manganese, 10µg Chromium, 27.5µg Selenium and 75µg Iodine. The Higher Nature Kids Smart Focus vitamins for brain function are a great accompaniment to their Vital Vits since they contain the essential omegas children need. The Smart Focus comes in a jelly form with a fruity flavour and no fish aftertaste! To make them simple to use and remember these too are in a one a day formula. They are also free from added sugars and artificial sweeteners. 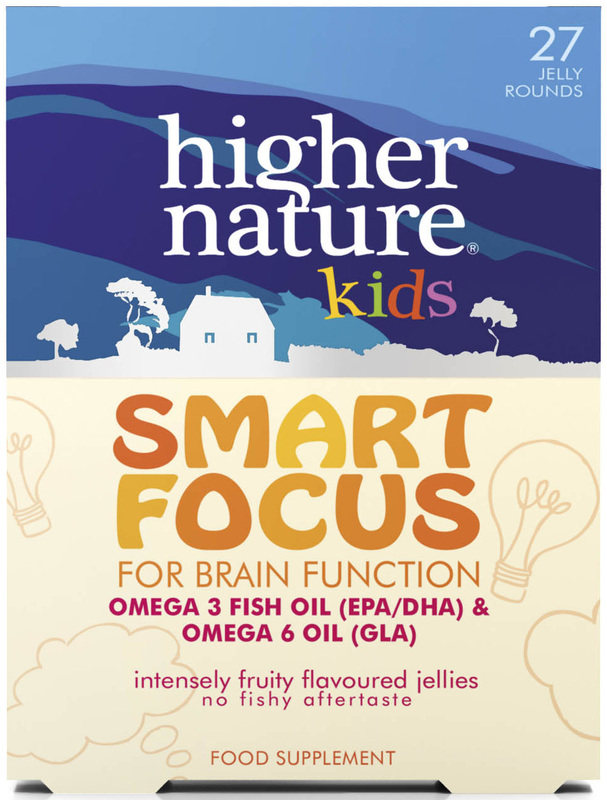 Higher Nature Kids Smart Focus is unique in the fact it contains omega 3 EPA and DHA (contributes to the maintenance of normal brain function) with Omega 6 GLA. These vitamins should help keep children focused while in the classroom. Higher Nature have very kindly given us one pack of each to giveaway to one lucky reader. You can enter using the link to the Gleam entry form below! Higher Nature is the sponsor of this giveaway and is responsible for prize fulfillment. You can purchase Higher Nature Kids Vital Vits in packs of 30 (£7.99) and packs of 90 (£14.99) along with Higher Nature Kids Smart Focus in packs of 27 (£9.99) by clicking on the relevant link. No. Children not using vitamins. Yes, we currently use vitamins for our children. I don't use vitamins on the kids at the moment. Yes I give my son chewable vitamins every day. I do on occasion but often forget to replace once they are finished! I give my son a vitamin c tablet daily to help boost his immunity for preventing coughs and colds. I’m not too sure if my niece has vitamins yet but I would love to win these for her! No, our children don't take vitamins currently. Yes not as much in summer , I'm quite forgetful! My granddaughter is not currently getting vitamins, but I think it would be a good thing to start.